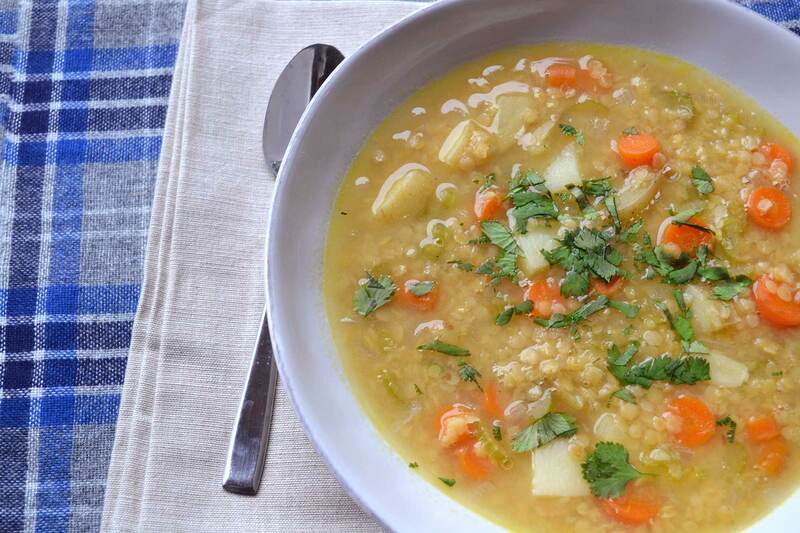 This red lentil soup with potatoes is comforting and filling. Serve with bread for dipping if desired. In a medium pot, heat the olive oil over medium heat. Add the celery, carrots and onion and stir to coat. Cover and cook for 5 minutes, or until the vegetables are soft. Add the broth, potatoes and garlic and bring to a boil. Turn the heat down to low and simmer for five minutes. Add the lentils, cover and cook 10-15 minutes more, until the lentils are soft (be careful not to overcook the lentils as they will begin to turn mushy). Season to taste with salt if needed. Ladle into bowls and garnish with cilantro.